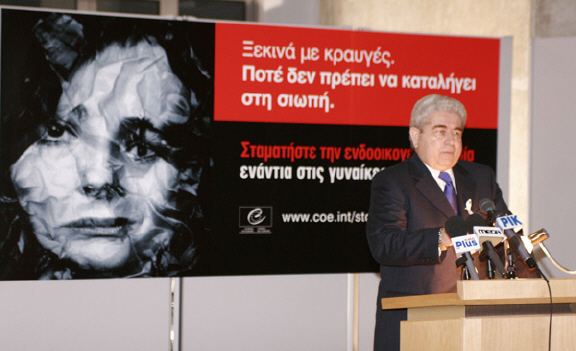 1st March 2007, event at the Cyprus House of Representatives with the theme “Stop domestic violence against women”. The event was organized in collaboration with the National Mechanism for the Rights of Women and the Advisory Committee for the Prevention and Combating of Domestic Violence, in line with the Council’s of Europe resolution on stopping domestic violence. The President of the Cyprus Parliament Mr. Demetris Christofias addressed the gathering and stressed out that violence against women constitutes the most inhuman manner of discrimination at the expense of women and that it is also a disgrace for civilization. Mr. Christofias confirmed the determination of the Cyprus House of Representatives to continue monitoring this issue through the House Standing Committee on Equal Opportunities for Men and Women. Τhe Minister of Justice and Public Order, Mr Sophocles Sofokleous, attended and addressed the event. The event ended with a projection of a documentary with narrations of women from all around the world who have suffered domestic violence. 250 people, among them current and former MPs, judges and other dignitaries of the republic, women’s societies and simple sensitized citizens, attended the gathering. During the event they were given out gift bags that contained informative material on domestic violence, aiming for the future sensitization of the public opinion on the subject.